A Malaysian airliner was shot down during a flight over Ukraine at an altitude of about 10,000 meters, an aviation industry source told Interfax on Thursday. A Malaysian plane en route from Amsterdam to Kuala Lumpur disappeared from radar at 10,000 meters and then crashed near the city of Shakhtarsk in Ukraine's Donetsk region, a source in the Ukrainian law enforcement authorities said. According to the source, the group of the state emergencies service is on way to the scene. A Malaysian airliner was shot down during a flight over Ukraine at an altitude of about 10,000 meters, an aviation industry source said. 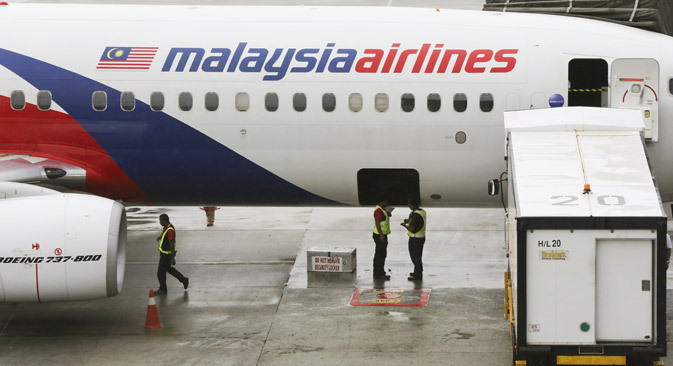 According to the earler reports, a Malaysia Airlines Boeing 777 has crashed in Ukraine not far from the Russian border, a source in aviation circles told Interfax. "A Malaysia Airlines 777, which was fling from Amsterdam to Kuala Lumpur started descending 50 kilometers before entering Russian airspace and was subsequently found burning on the ground on Ukrainian territory," the source said. The plane carried 280 passengers and 15 crewmembers, he said. The airliner was to cross the Russian border at around 5:25 p.m. Moscow time.